Bowling Green’s unbeaten streak is still alive. The Falcons fashioned an improbable comeback to steal a 4-4 tie with the University of Alaska Saturday in the Ice Arena. BG rallied from a 4-1 deficit with 10 minutes remaining, the final two goals coming from Ben Murphy with the extra attacker in the final minute. The Falcons, ranked 11th nationally, improved to 13-3-4 overall and 9-1-2 in the Western Collegiate Hockey Association. BG is 7-0-2 overall, its last loss coming Nov. 14 at home against Ohio State. Murphy tied the game with just 22.8 seconds remaining, intercepting a Nanook pass in the deep slot and firing the puck into past goalie Davis Jones. His first goal brought the Falcons within 4-3 with 46 seconds to play. Good work in the offensive zone set up Murphy in the left circle for the goal. The comeback started with Sean Walker’s second goal of the game on a laser from the point with 10:50 remaining. “I’m happy with the fight and the resiliency we showed, that’s something we’ve developed with our team over the last five years,” Falcon coach Chris Bergeron said. “We can take a few punches and still remain standing. The Falcons are 7-0-2 in their last nine league games, their only league loss coming Oct. 31 at home against Minnesota State. “I don’t think in games like this, especially for our upperclassmen, there’s not much panic,” said Murphy, a junior. “There’s a lot of fight in our guys, including the young guys, who understand what it takes to win. We’ll come out and fight like dogs. GAME-WINNER: On Murphy’s game-winner, the Nanooks had full puck possession in the corner to the right of their net. But they threw a pass up the middle — a major no-no in hockey — to Murphy, who has one of the hardest shots on the team. “That was a blessing. That was a prayer. I’m glad it went in,” said Murphy, who has four goals and two assists in his last six games. FINISH: The Falcons played a strong third period after a shaky second period to earn the tie. BG controlled the puck in the offensive zone during the third period, thanks to a good forecheck that resulted in scoring chances. “That was us. 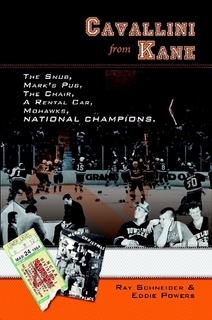 That’s Falcon hockey,” Murphy said. “There was a 4-1 deficit going into the third period at home,” Bergeron said. “That was a little bit of a wakeup call when weird night in the Ice Arena. The Falcons dominated the first eight minutes with the help of two power plays, but couldn’t score. The Nanooks then scored two soft goals — the first coming on their second shot of the game — to take a 2-0 lead. BG already had 10 shots before Alaska opened the scoring. Alaska took a 2-1 lead after one period, even though it was out-shot by a 17-9 margin. BG had the only four power plays in the first period and eventually scored on a two-man advantage with 3:47 to play in the third period. Walker had the goal from the top of the right circle. PULLED: BG goalie Tomas Sholl lasted just 16:38, allowing two soft goals and almost giving up a third goal. The Nanooks built their 2-0 lead on goals from Tyler Morley at 9:37 and Trevor Campbell at 13:46 of the first period. Morley scored on a seemingly harmless backhander through Sholl’s legs from the left edge of the crease. Campbell scored from the right circle. After Walker brought the Falcons within 2-1, Alaska thought it had restored its lead back to two goals just 25 seconds later. But the goal was disallowed after Sholl knocked the net off its post, scrambling back into the crease. Sholl started the play by playing the puck behind the goal line to nullify an icing call against Alaska. The play led to a Falcon turnover. The goal came from the right circle as well. “Not the performance in goal we were hoping for,” Bergeron said. Sholl was coming off a 34-save performance Sunday in a 4-1 win at No. 20 Robert Morris. Tommy Burke relieved and stopped 20 of 22 shots over the final 47:52. “Tommy Burke was fine,” Bergeron said. Burke is 4-0-2 in the league with a 2.21 goals-against average and a .924 save percentage. POWER PLAY: The Falcon power play had plenty of chances to score, even though it was 1 of 7. It had 10 shots in 11:49 with the extra man. BG earned those attempts with good play and hustle in the offensive zone. The Falcons also allowed a short-handed goal to give Alaska a 4-1 lead with 12:37 to go in the second period. Marcus Basara scored the goal, batting in his own rebound after Burke stopped his breakaway. The puck caromed to the right side of the crease and Basara knocked a waist-high puck into the net. The breakaway was created when a BG shot was blocked. Basara then took a pass as he came out of the penalty box to end the 5 on 3. NELL: The Falcons’ Chris Nell, who had 18 saves in BG’s 3-0 win Friday, is 4-0 in league games to go along with a 0.50 goals-against and a .980 save percentage. But he longer ranks among the national and WCHA leaders in those statistics because he hasn’t played at least 33 percent of his team’s minutes. Overall, Nell is 6-0-1 in seven games with a 1.41 goals-against and a .950 save percentage. EXTRA ATTACKER: Murphy’s two 6 on 5 goals were BG’s second and third of the season. The Falcons treat that situation like a power play. The extra attacker comes when a team takes its goalie off the ice. The extra attacker usually is in front of the net and helps with puck retrieval below the top of the circles in the offensive zone. “We haven’t been in that situation very often, but the opportunities we’ve had, we’ve done a nice job of getting zone time and creating chances,” Bergeron said. Tech is second in the league with 21 points, just one ahead of BG. Minnesota State leads the league with 27. BG has played two fewer games than Tech and four fewer games than Minnesota State. 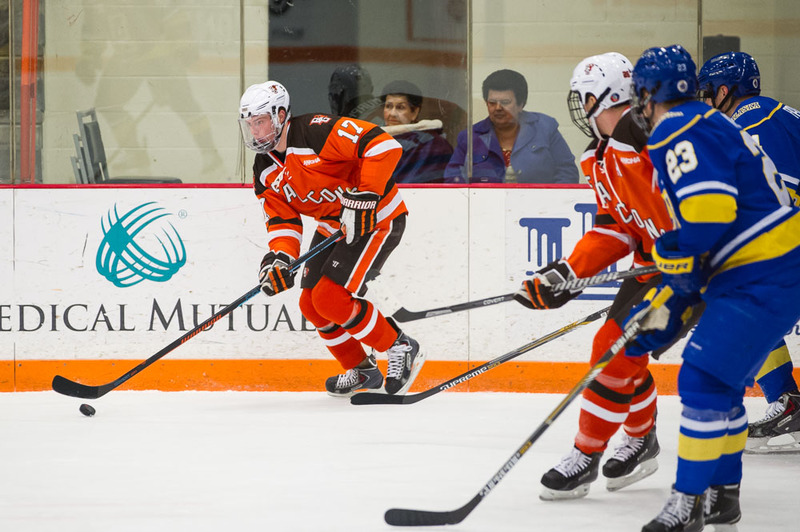 The Falcons swept Tech in a first-round WCHA playoff series last season in the Ice Arena. “It’s another opportunity to play league games that mean a whole lot, just like this weekend,” Bergeron said.